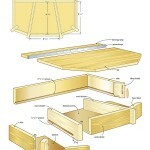 Start by cutting all of the box parts slightly longer than final dimensions noted in the materials list. 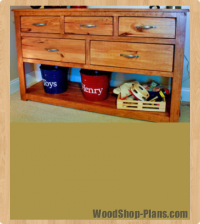 I had the luxury of some wider pieces of wood because of my source of reclaimed lumber. If you can’t find any stock quite so wide, you’ll have to laminate several smaller pieces together. Try to bookmatch a piece with a nice grain pattern when creating the box’s lid so that you preserve the clean design of the piece. Next, joint and plane all of the pieces to 3/4″-thick and 3 1/2″-wide. Now it’s time to cut some grooves. 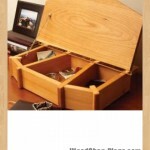 You’ll need 1/4″ x 1/4″ dados in the sides, back and front pieces to receive the cherry bottom. Also, make grooves in both sides of the main dividers ending one inch before the chamfered front ends. The small dividers are biscuited and notched, not grooved, to allow for the bottom. Biscuit the remaining miters and the two long dividers, then dry-fit to see how you did. The bottom pieces must be made and installed before you glue up the box, because the centre section is triangular and can’t be slid into place. Rip, joint and resaw the cherry pieces for the bottoms. You could use veneered ply for the bottoms, but solid wood adds a touch of class to an often forgotten part of the project, and it’s more fitting for a hand-made gift. Thin, solid wood can be re-sawn on a tablesaw with a thin-kerf rip blade. Pass the wood through the blade on edge, flip it over and repeat. To make the job safer, raise the blade a little at a time for this operation. Edge-glue the rough-cut cherry bottom blanks and plane them to 1/4″-thick when dry. The best way to sort out all of the dimensions of the bottom members is to dry-fit and then scribe the shape from the box. Work to those measurements; forget the materials list for this part of the work. Just make sure to add 7/16″ of extra width and length to allow for the grooves. Sand and finish the bottoms before assembly. While you’re at it, sand all of the other pieces as well, rounding the edges more than a bit with handheld sandpaper, in keeping with the angled and chamfered look of the project. 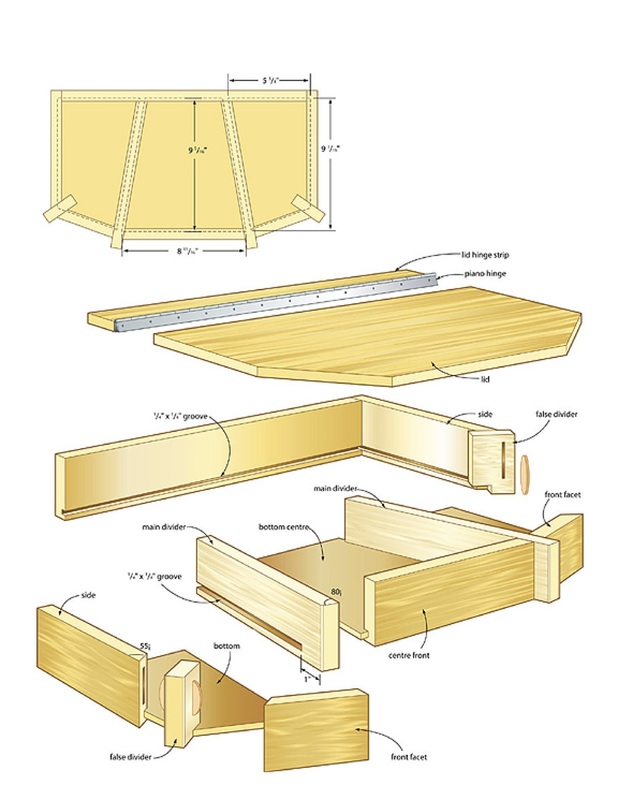 It’s difficult to clamp together mitered pieces that don’t meet at 90º, so make it easier on yourself by breaking up the job into a series of smaller glue-ups. Start the process by joining the centre front to the two main dividers. As you work, put the bottom panel in place. Use the same method to glue the false dividers to the sides. Once the sides and centre section of the box are dry, the remainder of the vanity valet should go together easily. Plane the lid and lid hinge strip to a 5/8″ thickness, then go ahead and cut these parts to length and shape. Fasten the two-inch-wide strip to the back of the box using two #0 biscuits. To attach the lid to the hinge strip, you’ll have to cut down a standard 24″ piano hinge at one knuckle, as close as you can to the 20″ mark. A hacksaw or cut-off disc on a rotary tool works well. Predrill and attach the piano hinge prior to gluing the lid assembly in place. In order to keep the lid from opening too far, buy a small, fine chain to attach to the inside of the box. Once the piece’s lid is dry, have a look at the inside of the box to find a spot where the upper chain bracket won’t hit any of the box members when the lid is closed. Mark the spots, predrill the holes and then secure the chain. Cut two 1/4″ x 1/4″ Douglas fir plugs to fill the exposed panel grooves at the back end of the box sides. With that done, attach four self-adhesive vinyl bumpers to the underside of the project to give it some grip and create a nice shadow line. I finished my vanity valet with three coats of penetrating oil; then, after the oil had cured for a week, I topped it off with two coats of beeswax polish. As for whether you fill up the piece with gifts before you close it up and wrap it, well, that’s up to you.